Wow, I feel like I've been away forever, but I guess work just gets in the way of the "fun" part of my life sometimes. I'm linking up this week to Ashley Sisk's Photo Scavenger Hunt. The items this week are Chocolate, Numbers, Canned Food, Music, and Stack. I have a lot of "music" stuff around the house since I play the piano, so I didn't want to miss out on this photo opportunity! Here are my interpretations for the five. You may have already seen this photo, so I just added a texture to change it up a bit. Old printers type numbers, just one of my many vintage treasures. I keep this old soup can on top of our refrigerator, we throw our bottle caps in there. A very well loved Chopin music book. Metal baskets I just purchased and distressed to look like old locker baskets. You can see all the other entries to Ashley's Scavenger Hunt by clicking here. I'm working on some little felt birds with embroidery, a relaxing project for the weekend. What have you been up to? I'll be by to visit soon! The locker baskets look awesome!! I love all of your beautiful photographs! The photos are all lovely. Can't even pick a favorite. I absolutely love every single one of these...perfect! Wonderful images - love the chocolate (!) and the music shots. Fabulous pics this week Becca. I really loved everyone of them especially with those textures. I used to play the piano and I loved playing pieces from the nocturnes. I literally love every single shot - love all the texture. Great work! I love the soup shot! That would look perfect in my kitchen!! what a brilliant selection of shots and I love your textures on them all, really great. Aren't Kim's textures nice? I don't use them near often enough. I love the texture you applied! Also, those baskets are really awesome- those are going to look great around the house! Love the vintage look of your photos. My favorite is the numbers. Really neat photo! What a wonderful collection. I love the vintage touch to all of them too. Gosh ~ that is an old soup can. Very cool. All your photos look fantastic Becca! I love the canned food shot. Love your music photo, but they are all great! wow I love the way you edit your pics..I love them all but your chocolate shot is my favorite..mine is up too..hope to see you..
i love your edits-- the textures are used perfectly. Your photo's look wonderful.. I love the old can of soup. And I just knew you would have a great shot for music. I must say your wire baskets look great..
What a great collection of photos, Becca! I love them and the textures look fantastic on them! I'm so with you regarding the workload...! love the photos and love the waves! Just love all the textured effects. The piano looks amazing and the chocolate shot is so effective! I love how you have tied them all together!!! Oh, I loooove the textures you used, so pretty! I think my favorite is the chocolate..or maybe the piano..
Nicely done, I love all of the textures on these. I had completely forgotten about locker baskets, very cool. Wow, great stuff, I love the vintage can and the metal baskets, what neat old things. 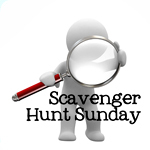 I'm glad I looked at your Sunday Scavenger Hunt b/c I think I like your blog alot! great shots!! I LOVE the shot of the chopin book! That originally was my idea to take a shot like that! But we just didn't have anything musical in our house! I love that worn book of Chopin. Do you play that? I love classical. Love the photo of the piano keys and notes across it. Actually I love all these photos. Incredible! I could look at them all the time!!! Becca - Each of these are so beautiful! These are all great, but my favorite is the second music shot. vERY cool. These are all so, so good! I especially love the piano music shot! All the photos are great, but I love the old soup can and what you do with it the best. I like tha baskets in your stack shot! Great job! I hope you'll post a photo of your felt birds when they're finished...you know how much I love these little creatures. Love all your vintage type stuff! Great texture work too! Loved the photos, Becca, especially the Chopin one with the circled sequence....bet that's a tough one. Anxious to see the felt birds. Great wave sound, too; LOVE the ocean. I love the way you have enhanced the photos... the texturing is just beautiful.